RADIOLOGY is an essential link in patient management. Its unique role within the hospital can be likened to a nerve centre. Just as a nerve sends messages to the brain, the information gained from radiology assists medical staff to diagnose and deliver appropriate healthcare to patients. Currently, the radiology department at Heal Africa consists of 3 staff working in 3 rooms – X-ray, Mammography and Ultrasound. Moba is both a sonographer and radiographer, while Constant and Lucie are radiographers. 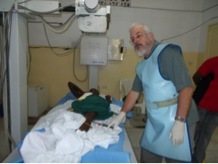 A fourth member, Dr SOSTHENE, is currently in Uganda completing his final year of training in radiology. During the AusHEAL Team’s visit, the Heal Africa radiology staff have been taught, guided and supported by Brisbane radiologist Dr Murray Thorn and sonographer and radiographer, Sue Reid. Obstetrics: During an ultrasound on a woman 21 weeks into her first pregnancy, the team was able to disclose that she was carrying non-identical twin girls. Interestingly, more twins are born in Goma than in Brisbane. In Goma, parents are keen to know the gender of their baby which the sonographer is able to disclose to them. General Surgery: Following a barium swallow, radiologist Murray Thorn was able to reveal to surgeon Neil Wetzig that the oesophageal bypass he had performed on a young girl was successful and there was no leakage. The twelve year old patient had accidentally swallowed caustic soda from an unmarked bottle. Caustic soda is commonly used in DRC villages to make soap. Dentistry: Just as in Australia, X-rays are routinely used to confirm whether there are caries present in a tooth. At Heal Africa hospital, the dental clinic doesn’t have its own X-ray equipment. Consequently, patients that require further diagnosis rely on imaging from the radiology department. Heal Africa dentists Siva and Lea are being taught root canal treatment for the first time by Brisbane dentist, John Yared. Root canal treatment requires 4 X-rays – one pre-op to help with diagnosis, one to determine the length of the tooth, another to confirm the correct placement of the filling material and one post-op. Without these, root canal treatments are reduced to guess work. Oral Surgery: Subsequent to the insertion of a plate into the mandible of a thirty year old woman who had an invasive ameloblastoma removed, an X-ray was able to verify to Oral and Maxillo-facial surgeon, Dr John Arvier, that the plate was stable and in a good position. Cardiology: An echocardiograph indicated narrowing of the aortic valve in a thirty-five year old gentleman. Consequently, AusHEAL cardiologist, Darryl Burstow, with his Heal Africa colleague, Dr Albin, received significant information to guide their decision on how to proceed with treatment. Emergency Department: A lady who had fallen off her “ moto” [motor cycles are the most common form of transport in Goma] presented at the ED with pain in her left hand side. Radiology was able to confirm that her spleen and her kidney hadn’t been ruptured. AusHEAL ED doctor, Graham Zerk reports that radiology is utterly integral to ED as 80% of ED patients require imaging. Medical: A woman came to the Heal Africa hospital from 250km away with faeces leaking out of her abdomen. Radiographer, Dr Murray Thorn and sonographer, Sue Reid, were able to use this case to teach the Heal Africa radiography department how to complete a contrast study. This demonstrated that the leakage appeared to be from one area of the small bowel. As a result, the surgeons felt more positive that they could help the woman and were able to operate. The contrast study provided the surgeons with valuable information of the site to look for. Orthopaedics: An X-ray showing congenital bowing of the tibia with stress fractures guided the orthopaedic team in their decision of an appropriate course of treatment for the patient. Injuries from moto accidents and gun shots cause severe fractures partly because of poor nutrition. These patients make up a good proportion of the X-rays performed in the X-ray room. Neonatal: An ultrasound on a 3 day old baby with a mass on his forehead enabled the size of the mass to be measured and gave insight into the composition of the mass. An X-ray allowed the radiologist to determine what was happening between the mass and the frontal lobe of the brain. Paediatrics: Imaging was able to confirm that after six days, there had been no change in size of the enlarged liver of a six year old boy. Such monitoring guides the medical staff in patient care. MAMMOGRAPHY is a recent addition to the suite of examinations performed by the department. A small, portable ultrasound machine has enhanced the capacity of the staff as they are now able to visit wards if the patient is unable to be moved to the radiology department. 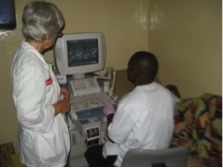 Radiology’s ability to assist medical staff with their diagnosis and delivery of care makes it a necessary adjunct to the hospital at HEAL Africa.